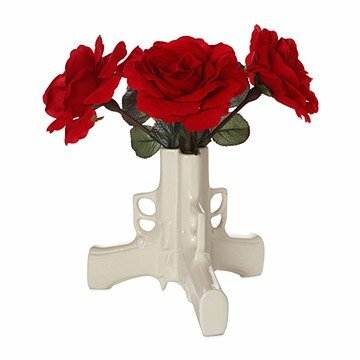 Make a peaceful statement with this ceramic flower vase in the shape of a pistol. Talk about flower power! White ceramic home accessories are all the rage right now and this pistol-packin' vase means stylish business. But in this case the pieces fire flowers, not bullets. Whether you're a James Bond fanatic or a former peace marcher, this vase will cover your table, mantel or windowsill in a fusillade of flowers. Made in China. Due to heightened concern about gun violence, UncommonGoods will be discontinuing this product. Until current inventory is sold out, UncommonGoods will donate 20% of the proceeds from this product to the Coalition to Stop Gun Violence. My friend likes pistols and he was amused by this gift. He said he likes looking at it in his home. I bought this for a male, gun enthusiast. It was so well received. In addition to the flowers it came with I included a pencil and a feather for variety. It's a great conversation piece and well executed. I've been wanting this for a while. Now that I have my own place we bought it for the kitchen table. Whenever someone walks in they always compliment the vase and ask where I found it. I love it. I use it as a centerpiece in my living room. everyone loves it! It's really a great little vase. The openings are too small for any live plants but I like the kitschy look. Unfortunately the flowers that came with it had spots allover them but they're not too obvious. Gave as a gift. Daughter loves it! Artsy, fun. I've been eyeing this vase for awhile and am so glad I finally got it for myself. Yes, the color is not pure white like other reviewers have noted, but you can't really tell unless it's next to something that is pure white. (So don't let the color put you off!) Overall, a beautiful and whimsical conversation piece.